Construction is complete, the ceremonial ribbon has been cut, and Lanco FCU is thrilled to invite all members to come see the newly expanded Brownstown Branch! A Grand Reopening celebration is being held April 15—19 at the branch, located at 4213 Oregon Pike, in Schaum’s Corner. 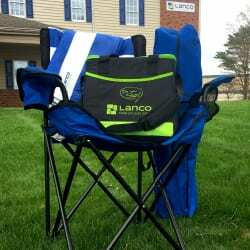 This awesome prize pack includes 2 Folding Camp Chairs, 2 Beach Towels, a Cooler Tote and more. †One per present member, while supplies last. ‡Modified hours: Wed. 4/17 all branches open at 10:00 a.m. for quarterly all-staff meeting. Fri. 4/19, all branches close at 1:00 p.m. for Good Friday holiday. *Maximum one entry per member. Must be present to enter. Entry period is April 15–19, 2019. One winner will be randomly drawn and notified by phone by April 24, 2019. Lanco FCU employees, volunteers, and their immediate family/household members are not eligible to enter.